Clubs or small groups of young people meeting with an adult volunteer–this is one of the main ways in which 4-H Youth Development works. They usually meet regularly for a special purpose, such as learning about a specific subject, presenting a demonstration or taking part in a field trip. The size of the group varies greatly, depending on the need and available volunteer adult and teen leaders. Groups may meet weekly, monthly, or on a schedule agreed upon by members, parents, and leaders. Most counties have both community and project groups. Community groups usually are made up of several project groups. Meetings include an educational program, business meeting and time for recreation. Demonstrations, guest speakers, special tours or “learn-by-doing” activities can be the educational part. Project groups focus on specific subjects-gardening, aerospace, food and fitness, service dogs, outdoor discovery, and teen leadership are examples. In addition, members frequently plan and carry out community service activities and entertaining events for themselves, their families and the county 4-H program. Special interest 4-H groups learn about a specific subject for a designated period of time. These groups may be short- or long-term, but their leaders are usually enrolled on a yearly basis. Counties’ ideas about what special interest 4-H is vary. Most day camps are special interest, i.e., horse camp, health camp, or sewing camp. 4-H programs presented to other youth groups, such as Scouts and Campfire, are considered special interest 4-H. Horseback riding programs for disabled riders, the Expanded Food and Nutrition Education Program (EFNEP), S.E.R.I.E.S., and 4-H Challenge are other examples. 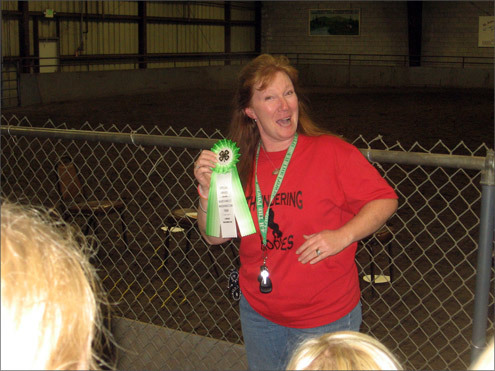 4-H Challenge encompasses a variety of educational activities. Youths develop a sense of inner responsibility and trust in others by learning goal setting, problem solving, and communication skills. Activities of bicycling, cross-country skiing, and “ropes” courses enhance these skills. Many counties or regions conduct resident camps where youths learn such important life skills as problem solving, decision making, communication, and cooperation, while experiencing a variety of activities. Camps may have a single focus such as food and nutrition, technology, horses, or offer a more general program. Teens or adults serve as counselors with a paid or volunteer camp director. These innovative, educational programs utilize volunteers, teachers, or extension personnel to share their interests and knowledge with children in their classrooms. School enrichment programs use 4-H materials to enhance existing school curricula. Examples are urban gardening, Ag in the Classroom, S.E.R.I.E.S., and Public Adventures. Programs can be adapted to fit the individual needs of the students and schools. Contact your local county extension office for more information regarding the specific curricula available for use in the classroom. School-age care (SAC) is the care of school-age children (generally ages 5-12) during times when there is no school. This may include before and after school on school days, school holidays, teacher conference days and summer vacations. School-age care programs have activities, environments, and equipment appropriate for the ages and development of the children. These programs may be conducted solely for school-age children or as part of a day care program that enrolls other age groups. The programs may be located in schools, churches, private buildings, or family homes. They may be profit or nonprofit businesses. 4-H Curricula. 4-H has provided appropriate curricula for school-age youths for over 80 years. This includes project materials, activities, and games in at least 60 specific subject matter areas, from nutrition to plant sciences to natural resources. Training. The core of each quality school-age program is its well-trained staff. WSU Extension 4-H can provide training on the developmental stages of school-age children, SAC program planning, appropriate group management techniques, food and nutrition, leadership skills, and sound business management techniques. Volunteers. In some counties WSU Extension provides volunteers who can present programs on such subjects as bread baking, gardening, games, clothing and textiles, and self-care. School-age care providers should check with their Extension Office for the services their local county can provide. Each county is unique and has specific policies for providing curricula. Parents involved in homeschooling their children are discovering 4-H curricula as a resource. Sometimes homeschooled children participate in 4-H activities and events, for the social benefits our program provides. Parents and their children may also utilize 4-H as a family club, the parents acting as leaders and the youth as members. 4-H is flexible, so your county may be offering 4-H in additional creative ways. Visit your Extension office and learn about ways to do 4-H where you live.